Who Can Wear Fur in This Heat? 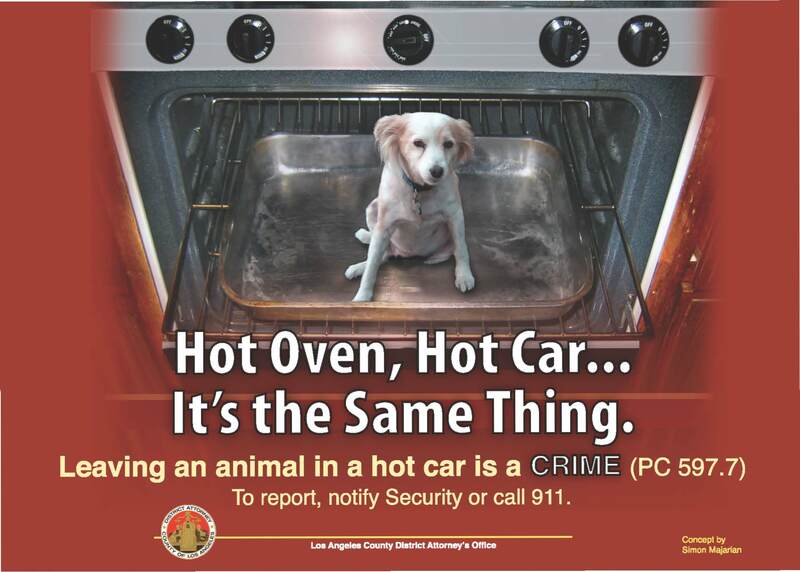 First and most important: The California State Penal Code states that it’s a crime to leave an animal unattended in a motor vehicle in conditions hazardous to the animal’s health: heat, cold, or lack of adequate ventilation (that means that the windows should be open, not cracked) and without food or water (see complete text here). Charges for violating this law range from misdemeanor animal endangerment, punishable by up to six months in jail, or felony animal cruelty with a prison term of up to three years if the animal dies. Try an experiment next time you leave your car in the sun on a hot day: experience how it feels when you enter and then stay inside the vehicle for a few seconds without opening a window or starting the air conditioner. Then imagine sitting in there for 45 minutes—you’ll get the idea. If you balk at leaving a window in your car open, leave your friend at home on hot days. Should you see a pet in a car in the conditions just described, call 911 or security. Authorities are allowed to break a window and rescue the animal. If you get an argument with the authorities—and it’s happened—quote the penal code. Better yet, get in touch with L.A. County Deputy District Attorney Deborah Knaan’s office at (213) 503-7254 and download a poster (see graphic) or request a bunch of cards to leave in people’s cars or to flash at anyone giving you an argument. If you have to take action yourself—well, it’s been done—but your call. Teddy takes a walk on the shady side with human companion Scarlett. Don’t walk dogs in extreme heat. Walk them early in the morning or in the evening when it’s cooler, shorten the walks, and don’t run. Keep them home where there’s plenty of shade, clean water and air conditioning, if you’re lucky to have it. 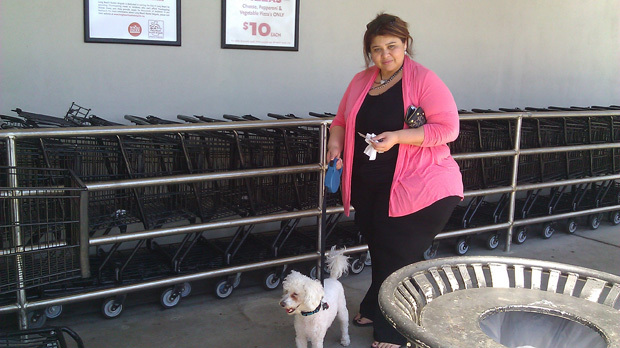 When you do walk your dog, walk him or her in the shade, on grass instead of asphalt. Just as you would, get a dog sun visor, sunglasses or goggles and apply sunscreen for pets to the cat or dog’s nose—especially light-colored noses—and any missing fur or anywhere the skin’s exposed. Put booties or protection cream on your dog’s feet (or your cat’s, if he or she will stand for it). They have feeling there, too—walking barefoot on hot pavement should give you some idea—or just touch the pavement with your hand to see how hot it is. All the items mentioned here can be found online or at pet-supply stores. Ask your vet for a recommendation for the sunscreen. Except for the aforementioned booties, don’t subject your pet to fashion on a sweltering day. Dogs pant to cool themselves off. Cats, though, don’t pant often unless they’re under stress or extremely overheated. Signs of overheating also include drooling, difficulty breathing, increased heart or respiratory rate, weakness or collapse. Elevated temperature (over 104 degrees), bloody diarrhea or vomiting also could be signs. Flat-faced dogs and cats (bulldogs, pugs, Persians and so on) are particularly susceptible to heatstroke because they cannot breathe efficiently; elderly, infirm and senior pets are also susceptible, so keep them cool. If you see any of these symptoms, slowly immerse the animal in cool (not cold) water and call your vet immediately. Long Beach has an emergency clinic, Long Beach Animal Emergency at 4720 E. PCH, right next to Centinela Pet Supplies. Phone: (562) 735-5200; there are others nearby as well. Give your dog or cat a summer cooler by dropping ice cubes into the water dish. Dogs and the occasional weird cat enjoy splashing in a kiddie pool—even more summer fun for everyone if you have a young child as a bathing companion. Brush the cat daily and occasionally wet him or her down with damp towels. Let the cat lie on the tile floor and the bathtub. Finally, do not shave the cat. Or the dog, for that matter. Dogs, depending on the breed, need their fur to keep the sun away as do all cats; cat fur, furthermore, keeps the animal cool in the summer and warm in the winter. It’s like insulation. Thanks to Long Beach Animal Care Services and spcaLA for helping with these hints. The brushfire in the Los Cerritos Wetlands was extinguished pretty quickly; many thanks to our quick-acting fire department. Many area businesses were evacuated, including the Petco on Second Street and PCH. All the live animals, including the adoptable cats from the Helen Sanders CatPAWS rescue, were quickly and efficiently relocated as well, according to CatPAWS cofounder Annelle Baum. CatPAWS’s kittens went to a facility that the group had built for their rescues, located inside the Joyful Paws pet hotel. The birds, Baum said, were not returned to the original facility for a couple of days lest there be residual smoke. “I am so impressed,” Baum said. Sammy is one of the two cats rescued by Helen Sanders CatPAWS and evacuated from Petco, but he’s back now and ready to go home. 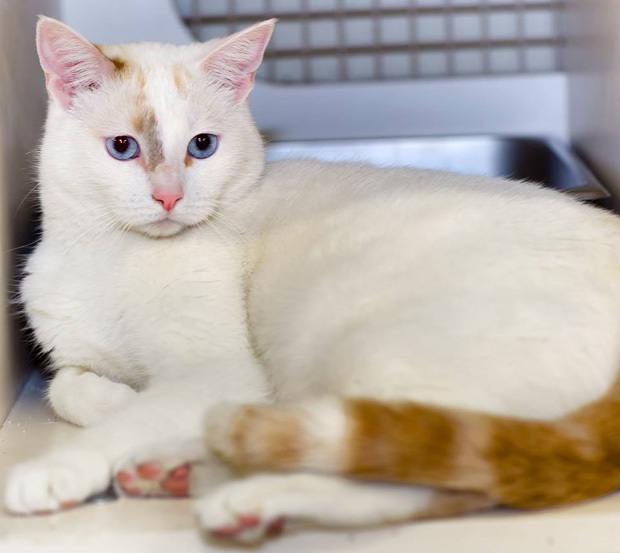 This gorgeous 1 ½-year-old Siamese mix was given a last-minute reprieve on Death Row, and he gets to celebrate the second of his nine lives with a loving family. 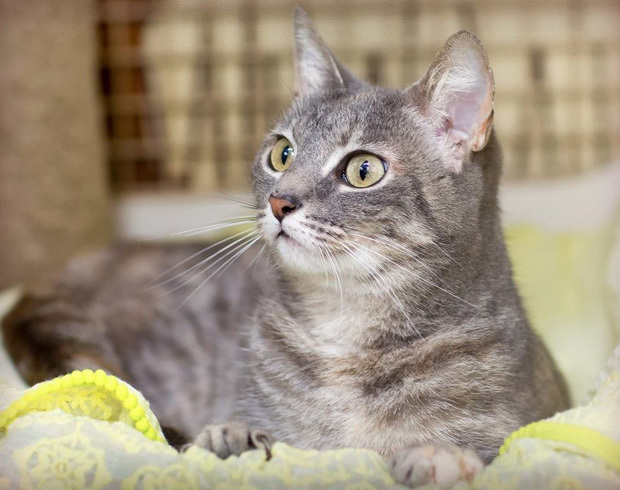 Miss Meow is a 2 ½-year old silver tabby and the other Petco evacuee. Her owner died and there was no family to take her in, so she wound up at a shelter. Helen Sanders CatPAWS stepped in, and she’s waiting for a loving home. Meet both cats at the Petco on Second Street and PCH in the Marina Shores Shopping Center. Help a pet better his or her chance at adoption! spcaLA is looking for foster parents for pets of all ages and needs. Potential foster parents must fill out and submit an application, available here, before attending a class. For more information, call (323) 730-5300.
spcaLA and Animals for Armed Forces Foundation honor and say thanks to our dedicated service men and women by providing free pet adoptions. The adoption discount applies to active duty, Reserve, and veterans of the Army, Navy, Air Force, Marines, Coast Guard and National Guard and/or immediate family members. (Must provide documentation, for more info click here). Adoption fee is waived for first 50 pet adoptions, limit 2 per household. Adopters must meet spcaLA adoption requirements. Additional fees such as medication, e-collars may apply. You don’t want to miss out on a great day in the park for a great cause. Marie Hulett, the host of the Pet Place Radio Show, will be the MC for the event. Joining her will be DogPACT, providing K9 agility and “nose work” demonstrations throughout the day with Tess, a member of the K-9 Bed Bug Detection Team with the uncanny ability to locate bed bugs. There will be other animal demonstrations and exhibitions, animal rescue and adoption groups, live entertainmentby the Blue Steel Band, vendors of all kinds, great raffle prizes, food, a kid zone, special guests and much, much more! A bike valet will be available for those who want to ride to the event, which is free and open to the public. Topreregister for the WALK itself, click here. The cost is $30.00 and includes two complimentary Laugh Factory Long Beach passes, great discounts, a WALK T-shirt and more!Registration the day of the event is $35.00. 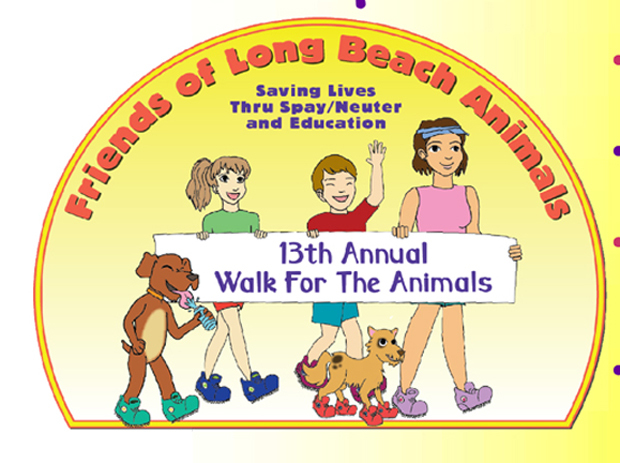 This event raises funds for FOLBA, a nonprofit organization in its 23rd year serving Long Beach and Signal Hill, committed to saving animals’ lives through spay/neuter and education programs and fostering responsible pet ownership, education and humane treatment of all animals. It’s spcaLA’s biggest pet adoption event of the year—come find your Friend for Life!Enjoy a day of sunshine and pet adoptions at spcaLA’s Companion Animal Village in Long Beach! Pet adoptions, vendor booths, refreshments, silent auctions, and family fun. Be a good dog-park visitor. Understand and learn to recognize good and bad behaviors to encourage positive interactions at the dog park. This class is for humans only. Please do not bring your dog to class!